With the success of the Wild Apple renovation and refresh, our team was called upon again when the client decided to expand the space and convert the restaurant and lounge into a modern pub with adjoining multifunction room. Expanding the exterior walls out towards the lake created an opportunity for us to rethink the glazing. We opted for retractable wall sections instead of traditional windows to allow the space to be wide open during the warmer months taking advantage of the breeze off the water and stunning views of the lake. 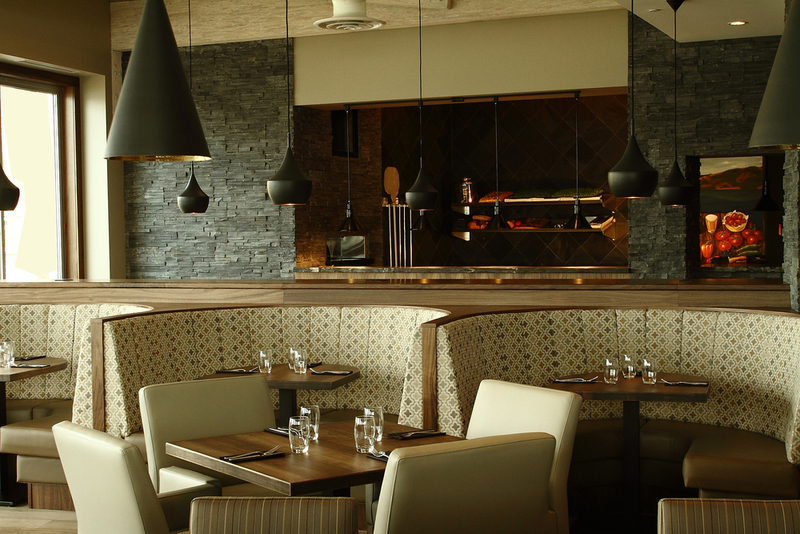 Cozy private booths, leather lounge style seating, an open concept kitchen with forno oven and a warm palette of natural materials create a warm and inviting atmosphere. Wide plank oiled wood floors in a grey wash create a modern casual feel while inlayed carpet tile acts as an area rug to define the lounge seating. The dining room is punctuated with Tom Dixon pendant lights while the bar glows with the smoked glass and exposed filament bulbs of the Niche Modern fixtures. Marble herringbone mosaic tile adds texture to the back bar and breakfast bar backsplash while charcoal grey ledge stone adds texture and interest to the forno oven and structural elements.